Adlethan-based artist Peter Kopilow's history with Leeton Shire led him to enter the 2014 Penny Paniz Arts Memorial Competition. 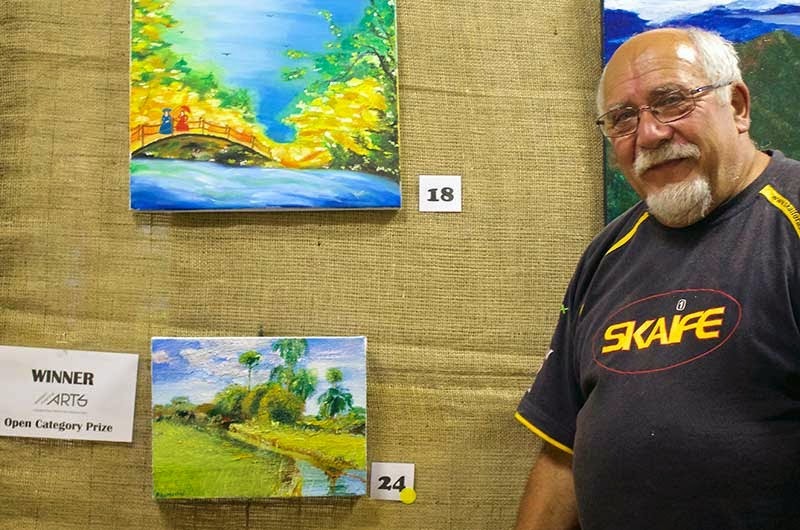 He ran a gallery in Yanco for a few years and it was a painting showing this time that won him the open category. "It's my first impressionist work," says Kopilow. "I've done a lot of expressionistic work but this was my first attempt. The painting shows the view out the front yard of where I lived in Yanco. I took a photo of it and this is my impression of it." 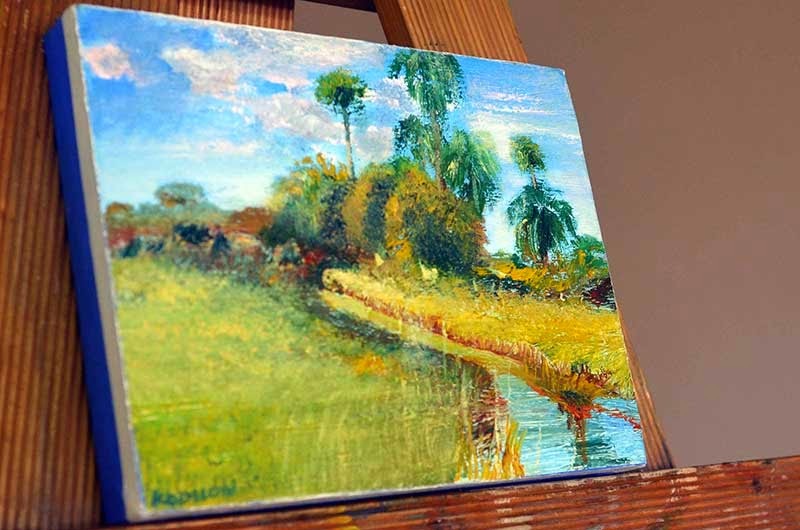 The winning work 'Canal and Palm Trees in Yanco' is currently on display in Griffith, one of a dozen of Kopilow's paintings showing as part of the Western Riverina Art Trail. It's a distinctly recognisable scene among abstract works showing the play of light in different settings -- a series is called 'Elemental Studies'. "All those works are subconscious," explains Peter Kopilow. "It's not about reality, as we know it. It's what comes from the subconscious mind. It's an automatic process, I start painting and see where it leads. The paintings were a complete surprise. They started as a doodle but I was pleased with the result." Likewise Kopilow's career has taken shape through reflection and incremental steps. "It's taken 50 years to get to this point," he says. "I chose a career in window-dressing then taught myself sign-writing, which led into painting." Peter Kopilow wonders whether he should have pursued painting earlier, having won awards in 1973 but waited 20 years before joining the Queanbeyan Art Society and then the Fairfield City Arts Society on moving to Sydney in 1997. "I taught myself sign-writing and ran a business for 25 years. I can afford the luxury of painting now that I'm on a pension." As a self-taught artist he experiments with styles and materials to explore painting. "I'm now experimenting in oils again after working with acrylics," says Kopilow. "It's like I'm continually experimenting with myself." The effort is clearly rewarding for painter Peter Kopilow, both personally and now financially through winning the Western Riverina Arts' sponsored open category in the 2014 Penny Paniz Arts Memorial Competition.